The color of the Snow Leopard is one that is said to be beyond all other felines out there. The Snow Leopard is medium sized and it features a coloring that ranges from various shades of browns and grays. They have black coloring on them that is very speckled. Under the belly, the chin, and around areas of the face they are white or cream in color. They range in size from 60 pounds to 120 pounds. 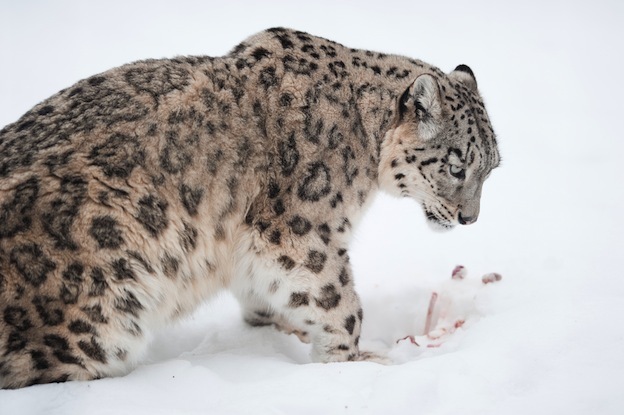 The body of the Snow Leopard is one that is worth taking a closer look at. They are very strong and powerful animals. They have lots of strength in their shoulders as well as their legs. You will notice they have very large paws and that helps to keep them balanced as they move along. They also rely on the length of their tail for balance. The paws have hair on the bottom of them to help prevent the loss of heat. They can cover their face with the thick tail too when they are resting so that they don’t get cold. Even though these animals live in very cold areas they are able to move around with ease. The design of the paws allows them to move through the rocky mountain terrain. It also helps them to move effortlessly across the snow and ice that can accumulate throughout the year. The fur is much thicker than on other felines. They also have small ears that helps them to conserve body heat. The large nasal passages of the Snow Leopard allow it to take in more oxygen. This is very important due to the air in the mountain area is much thinner. The dome shape of the head is also believed to help them with their breathing efforts in their cold location. What occurred that led this particular species of Leopard to live in such cold regions? Many believe that they had to evolve or die in that area. It is possible that they were one of many species in this area. However, others either moved on or they weren’t able to evolve enough to survive in such an environment. There is a great deal of investigating that still needs to take place for us to fully understand the past of the Leopard. We don’t know much about where they branched off from other felines. Many experts are hopeful that one day some fossils will be found that explain some of the lingering questions. The Snow Leopard doesn’t have the ability to roar like some of the other felines. They do use other communication sounds though including hissing, meowing, growling, and wailing. They are territorial but not to the same extremes as other felines. The boundaries are loose as long as there is food. The Snow Leopard heavily marks its territory with urine to indicate to others that they have a claim in given areas. While there have been many reported attacks on humans by felines, the Snow Leopard isn’t one of them. They are rarely seen by humans due to the way in which they blend into their surroundings. On the rare occasion when they are seen they have left without any type of conflict. They will even leave food that they have killed if they feel threatened by humans rather than fighting. Many researchers are curious about what makes that so different for this type of animal than for other felines. 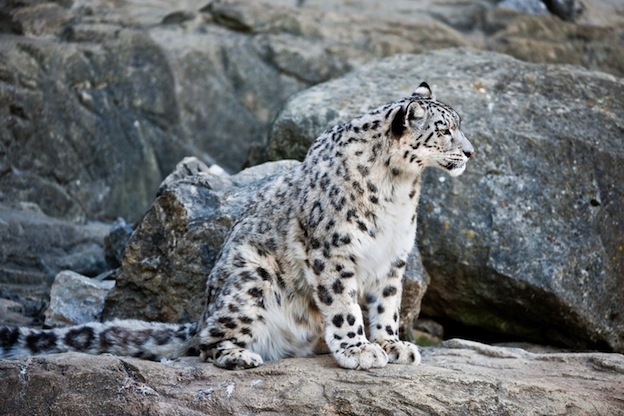 South Asia is where the Snow Leopard is known to live. They do very well in the mountain regions here. What you may not know is that they have a very diversified habitat range. It covers many countries including China, India, Russia, Pakistan and other nearby countries. They tend to live higher up in the mountains during the summer months than they do in the wintertime. Like all Leopards, they are meat eaters and actively hunt as often as they can for their food sources. They will eat anything they can get their hands on. This includes left overs that other animals have bypassed. It also means livestock and domestic pets should they be in that area. With humans moving closer and closer to the natural environment of the Snow Leopards it is becoming a frequent scenario. What they eat though often depends on what part of the mountain range they are in. Food sources include sheep, deer, wild boars, monkeys, rodents, and hares. They will take down prey that is large when they can so that it serves them for several days. However, they are content to consume smaller prey as long as they need to in order to survive between those bigger opportunities. The fact that the Snow Leopard is able to leap up to 50 feet definitely gives it the upper hand when it comes to getting their prey. They will hide and wait patiently for the right opportunity to attack. It does take up energy when they attack and they need for that to result in food. If they can’t complete the attack in just a few seconds they will abandon the prospect. Mating for the Snow Leopard occurs in the latter part of the winter. This allows for the cubs to be born either in April or June when it is warmer. There is a short mating season though and the males and females will usually pair up. The mother takes efforts to prepare a den for her arriving young. She will begin to shed her thicker coat during this period of time. That fur will be used as a liner of the den in order to offer more heat. There can be up to five cubs born at once but usually there are only two or three. They are blind at birth but will open their eyes when they are about a week old. They will be weaned at about ten weeks of age. Then she will introduce them to meat. They will leave the den at about two months of age and start to assist her with hunting. However they often remain with their mother until they are about one and a half or two years of age. The males tend to move a long distance from their mothers. This could be a natural method of them preventing breeding too closely to their own genetics. The female offspring tend to stay within fairly close proximity. There aren’t any natural predators for the Snow Leopard to worry about. Sometimes the young can become victims but only when they are away from their mother. The fact that there aren’t too many other predators that live in this same area though means they are generally safe. Humans are the name concern when it comes to the future for this feline. It is believed that only about 6,500 Snow Leopards remain in the wild today. Approximately 600 of them are found in captivity at various zoos. They are prime attractions that people love to be able to see. This can also raise awareness about what should be done to help them avoid extinction.